Germany has a program to increase its electricity production from renewable sources to 80 percent by 2050. The country produced a record 27 percent of its electricity from renewable energy during the first quarter of 2014 due to increased renewable capacity and favorable weather. While the country’s electricity generation from renewable energy is on the upswing, however, there are ramifications to this program that include instability of the electric grid, the need to secure back-up power that is reliable, and the burden on its households to pay for the high cost of electricity. German utility companies are receiving payments from the grid to help stabilize the electricity network that has been destabilized by drops and surges from wind and solar power. Coal is being used more heavily to back-up the intermittent renewable technologies and to provide reliable base load power that is increasing carbon dioxide emissions. Households are paying heavily for subsidies such as feed-in-tariffs that subsidize the high cost of renewable technologies. While retail prices of electricity are rising for German consumers, wholesale prices are artificially going down, threatening the reliability and the stability of the electric system. Wholesale electricity prices in Germany have dropped 60 percent since 2008 as renewable energy, which is heavily subsidized and has priority access to the grid, gets dispatched first due to its much lower short-term marginal production costs than traditional plants, displacing natural gas, coal and nuclear power. These high cost renewables, subsidized mainly by German households, have increased the country’s energy poverty, with average residential rates 3 times higher than the residential rate in the United States. As a result, lawmakers backed a change to Germany’s renewable laws to curb green subsidies and slow gains in consumer power prices that are the second-costliest in the European Union. 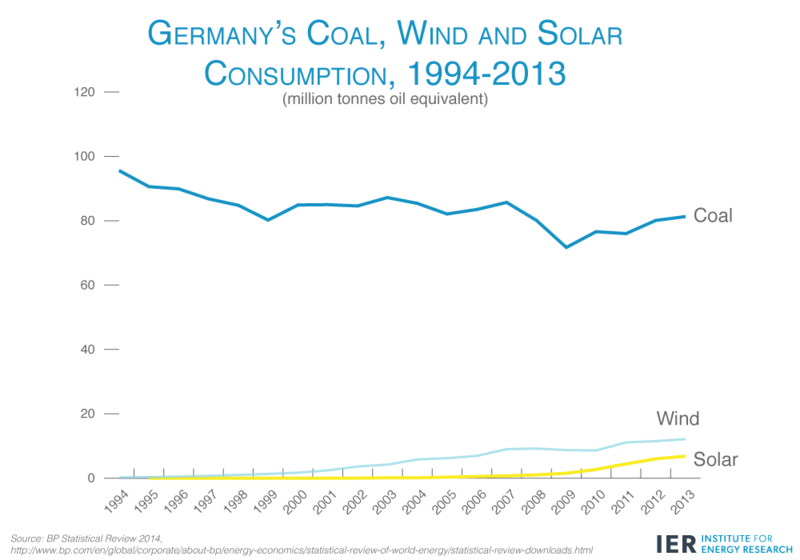 But these incentives have increased Germany’s solar and wind power output. In fact, Germany hit a new record in May of this year, producing 74 percent of its electricity from renewable sources during a portion of daylight hours around midday. [ii] That resulted in day-ahead power prices in Germany to be negative for much of that afternoon. (See chart below. 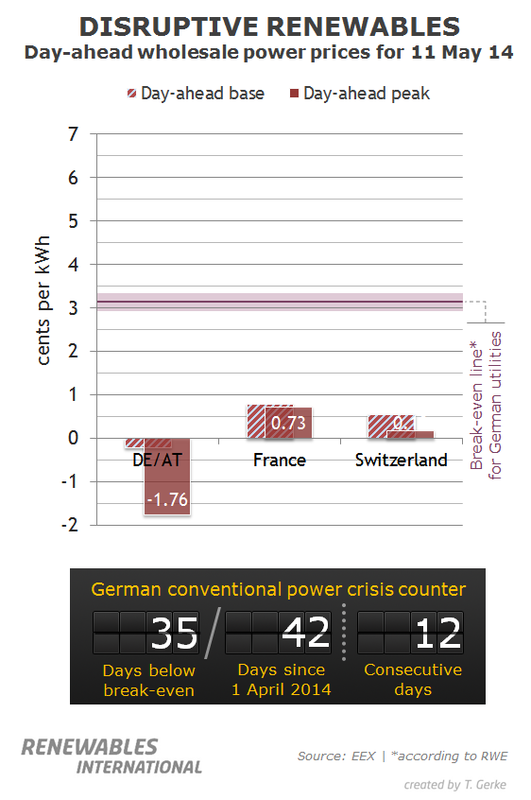 )[iii] Note that the break-even point for German utilities is just above 3 cents per kilowatt hour. This is making traditional utility plants close, despite their generating the majority of the power that Germany needs. These plants provide backup power for intermittent renewable sources, so their closure further weakens the grid’s viability. In order to keep the power system stable, twenty power companies operating in Germany get paid for pledging to add or cut electricity within seconds, according to data from the nation’s four grid operators. The utility companies have gotten paid as much as 400 times the wholesale electricity price by participating in the balancing market. According to one grid operator, the increased intermittent renewable electricity production has resulted in five times as many potential disruptions as four years ago, raising the risk of blackouts and pushing wholesale prices to a nine-year low. Utilities are joining the balancing market as weak prices have cut operating margins to 5 percent on average from 15 percent in 2004. By joining the balancing market, companies are earning about 10 percent of their plant profits. In Germany’s daily and weekly balancing market auctions, utilities have been paid as much as 13,922 Euros to provide one megawatt of generating capacity on an as needed basis to stabilize the grid. Utility companies must be ready to provide power or cut output in notice periods of 15 minutes, 5 minutes or 30 seconds. These companies earn fees whether their services are needed or not. Balancing-market payments to utilities totaled 800 million Euros ($1.1 billion) in 2013 about the same as in 2012. As an example of the amount of power needed for stabilization, in one week, utilities were asked to reserve 3,898 megawatts, which compares with Germany’s total installed generating capacity of 183,649 megawatts, about 2 percent. 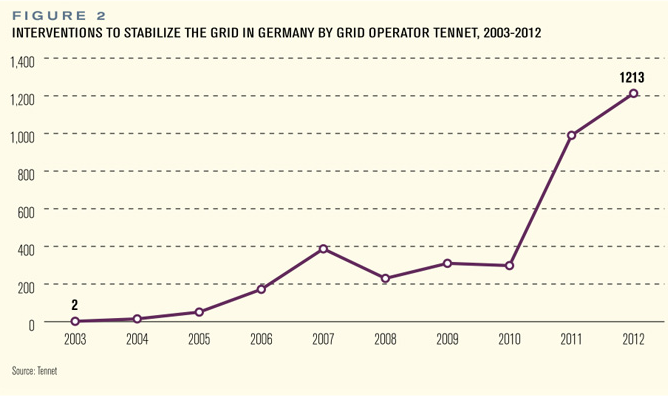 In 2013, Germany’s second-largest grid operator told power plant operators to adjust output 1,009 times to keep the grid stable, compared with 209 times in 2010. The number of interventions in 2014 for this grid operator is expected to be the same as in 2013. [v] Other grid operators are experiencing similar interventions. As Germany expands its renewable capacity, its electric grids will need to be refurbished to handle additional loads and be expanded to reach remote locations where renewable resources are more prevalent. Germany is increasing its electric grids to facilitate new wind farms, both onshore and offshore, and solar farms with an estimated investment between 21 and 27 billion Euros over the next decade. German residents are learning that its country’s renewable energy laws come with ramifications that include high cost electricity from subsidization of renewable technologies, energy poverty, destabilization of the grid, and increased carbon dioxide emissions from the back-up power needed to supply reliable power when the sun is not shining and the wind is not blowing. German Energy Commissioner Gunter Oettinger has declared that “the deindustrialization has already begun.” To ensure grid stability, electric grid operators have had to pay electric utilities to provide flexible power resulting in investments to convert coal-fired power plants that were originally built to operate 24 hours a day to flexible plants that can power up or down with little notice. But, it is becoming more and more difficult for traditional plants to survive in this environment, causing some to close. 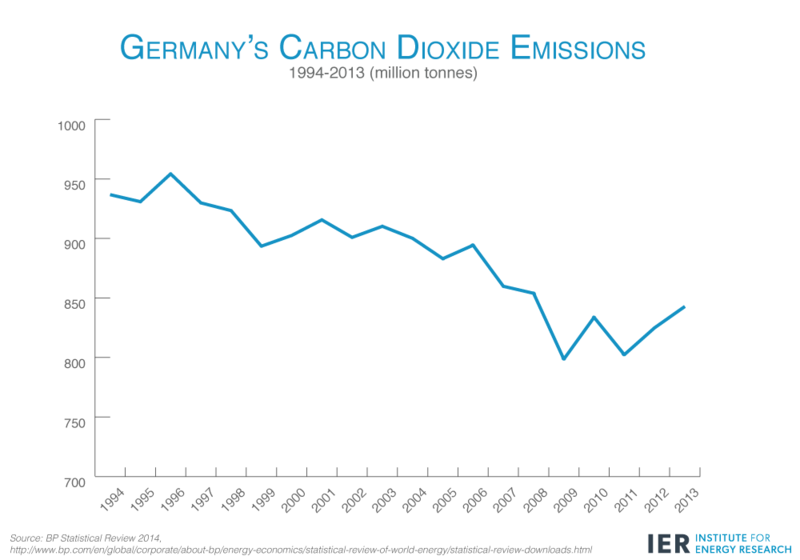 The outcome for Germans will be a higher potential for black-outs and increased energy costs to pay for an expansion and upgrade to its electricity grid and the conversion of its coal plants to be as flexible as needed. Whether it will further deindustrialize Germany remains a significant question for its leaders and the people of Germany.